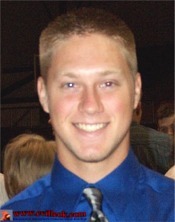 Alex Goossen will be one of about 180 CHS Seniors who will each have their own page on cvilleok.com. Those pages are to be completed by May 1st, 2009. Each student or parent is invited to submit a few favorite photos to be included on their page. Contact Ted Wright (wrightted@aol.com) for additional information on photos or advertising on those pages. 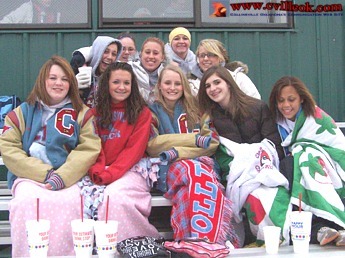 The chilly weather kept these fans bundled up for the March 2nd CHS Baseball home opener. 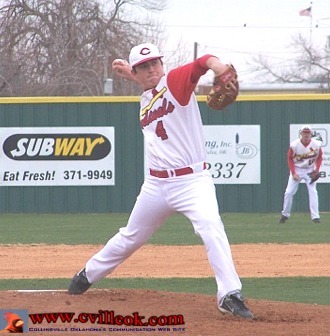 Brock Werdel (#4) worked past a 4 inning first and was back in the lead at 5-4 when I left after 4 innings as the Cardinal offense had chipped away with a run each in the 1st, 2nd, & 4th, plus two runs in the 3rd inning. 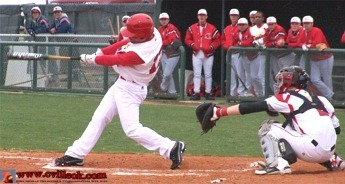 Josa Olazagasti (#12) got the first Cardinal hit in the first inning with this double. 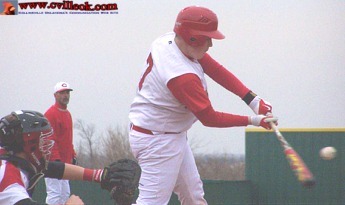 Peter Rodrigez (#13) led off the second inning with double and scored (above) on a Randy Roger's double. 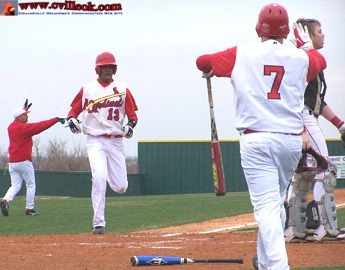 Coach Tony Reeder and Jordy Musto (#7) were directing traffic. Jordy Musto (#7) connects on a sacrafice fly in the 3rd. 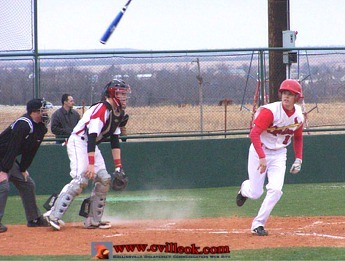 Randy Rogers (#16) flipped his bat towards the dugout after drawing a bases-loaded walk to tie the score at 4-4 in the 3rd inning. 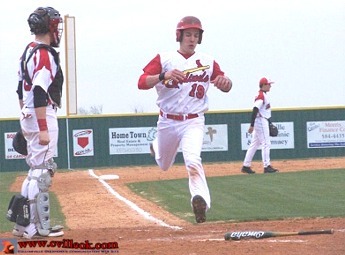 Riley Murr (#19) put Collinsville up 5-4 in the 4th after his leadoff single was followed by an error and a Josa Olazagasti single.